J Wang, B Wang. Pulmonary and Cardiac Talcosis. The Internet Journal of Cardiology. 2006 Volume 5 Number 1. We are reporting a case of pulmonary and cardiac talcosis in an IV drug abuser. The prominent cardiac talcosis is found in addition to expected ischemic changes of the heart and pulmonary talcosis. The pathogenesis of the talcosis is briefly reviewed. The IV drug abuse of oral medication can cause systemic talcosis, especially pulmonary talcosis. The pathogenesis of pulmonary talcosis has been well studied and documented. However, the mechanism of cardiac damage is currently considered as a consequential event mainly due to pulmonary hypertension and ischemia. The cardiac talcosis is poorly documented in literature. A potential direct damaging effect through granuloma formation is to be illustrated in this case report. A 46-year-old African-American male with known history of chronic obstructive pulmonary disease (COPD), depression, Hepatitis B and C, and IV drug abuse was hospitalized for evaluation and management of shortness of breath. The hospital course was further complicated by pneumonia, fungemia, anemia secondary to epistaxis and edema. During the hospital stay, he became more hypoxic and was noted to be in respiratory distress. He was transferred to ICU for close monitoring and was also on bilateral positive air pressure (BIPAP). Subsequently the patient became confused, tachypnic and progressed to unresponsiveness. The patient died of respiratory failure. An autopsy was performed to find the cause. Significant autopsy findings were found in the patient's lungs and heart. Moderate emphysema is present in both lungs. Clear plural fluid is present on both sides (> 300 ml, bilateral). Clear ascities (> 1 liter) was noted. Microscopically, extensive crystal deposits (birefringent foreign bodies, polarized light) were seen on both the alveolar walls and the interstitial spaces. There were diffused thickened alveolar walls with crystal deposits and fibrosis [Figure 1, 2]. Multi-nucleated giant cells were noted on the alveolar walls. Moderate congestion was also seen. 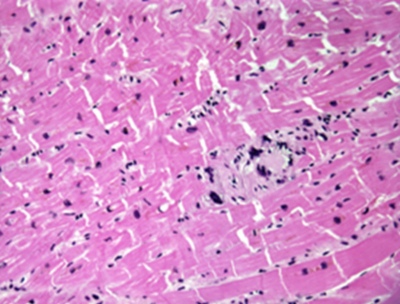 To our surprises, Sections of the right ventricle myocardium not only showed severe hypertrophy and fibrosis [Figures 3], but extensive crystal deposits were noted also (birefringent foreign body, polarized light) [Figure 4]. No acute inflammation was noted. In addition, the liver and spleen also demonstrated the crystal deposits. Talcosis or talc pneuonoconiosis is a common pulmonary disease occurring in IV drug addicts who also inject tablets intended for oral use [1, 2]. Because most tablets (including phenmetrazine and methylphenidate) contain talc, which is used to hold the components of the medication together in tablet form, this practice can cause arterial obstruction by the foreign material. 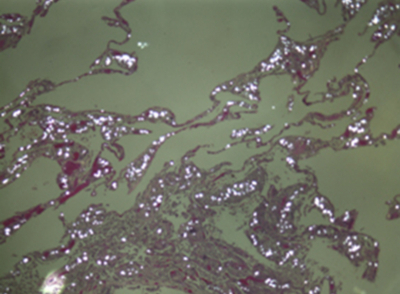 When these talc-containing drugs are injected into blood vessels rather than swallowed, foreign-body granulomatous reactions occur. Injection of these talc-containing drugs into a peripheral artery may cause ischemic necrosis of the distal extremities or other organs. The more common practice of injecting these drugs into peripheral veins results in foreign-body granulomas in the lungs. The reaction to talc, however, is variable. In some patients, widespread granulomas develop in the interstitium of the lung but relatively few in the pulmonary arteries. In other patients, this interstitial reaction may eventually lead to interstitial pulmonary fibrosis and to clinical evidence of restrictive lung disease. Other patients, after intravenous injection of oral medications, have talc granulomas predominantly in the lumens of small pulmonary arteries rather than in the interstitium. The result in these patients is pulmonary arterial hypertension rather than interstitial pulmonary disease. The pulmonary hypertension causes medial hypertrophy of the pulmonary arteries, often-intimal fibrous thickening, and occasionally plexiform lesions in the lungs. The occurrence of plexiform lesions indicates that the pulmonary hypertension is irreversible . Cardiac talcosis or talc damage to heart is largely neglected by most of physicians. The limited source of autopsy heart of IV drug abuse and focus on pulmonary talc pneuonoconiosis contribute to the above phenomenon. Few reports describing the cardiac damage are found in medical literature. The talc or other inert particles can become trapped in arterioles and capillaries, resulting in endothelial injury, inflammation, and thrombosis. In time, the talc particles may migrate through the vessel walls into myocardial cells. Thus, this disorder involves diffuse intravascular and pervascular noncaseating granulomas with resultant fibrosis. These adverse reactions not only apply to the lung, but also to the heart. Werebe  reported that high incidence of talc inside coronary artery, pulmonary artery, and myocardium after intrapleural administration in rats. Youmans  reported a fatal cardiac arrest of undetermined etiology in a 23-year-old youth immediately after a pleural poudrage. 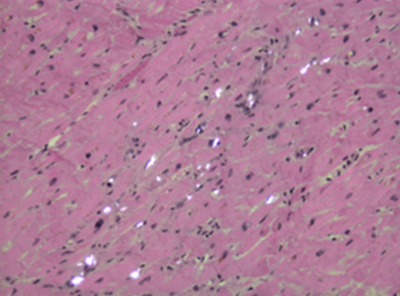 In our case, histological sections of hearts demonstrates extensive cardiac damages including myocardial infarct, myocardial hypertrophy, and granuloma formations. A small percentage of IV drug abuse will result in the pulmonary hypertension from extensive interstitial fibrosis, pulmonary thrombosis and pulmonary hypertension. These patients eventually will develop right heart failure. We speculate that the direct damage to myocardial cell and even infarct may also play an important role in the right heart failure. In summary, talc particles cause extensive organs damages, predominately in the lungs. It also causes irreversible damage to heart and other vital organs by direct and indirect mechanisms. 1. Arnett EN, Battle WE, Russo JV, Roberts WC. Intravenous injection of talc-containing drugs intended for oral use. A cause of pulmonary granulomatosis and pulmonary hypertension. Am J Med. 1976; 60:711-718. 2. Paré JP, Cote G, Fraser RS. Long-term follow-up of drug abusers with intravenous talcosis. Am Rev Respir Dis. 1989; 139:233-241. 3. Roberts WC. 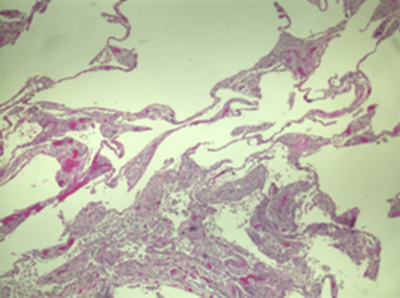 A simple histologic classification of pulmonary arterial hypertension. Am J Cardiol. 1986; 58:385-386. 5. Youmans, CR, Williams, RD, McMinn, MR, et al (1970) Surgical management of spontaneous pneumothorax by bleb ligation and pleural dry sponge abrasion. Am J Surg 120,644?